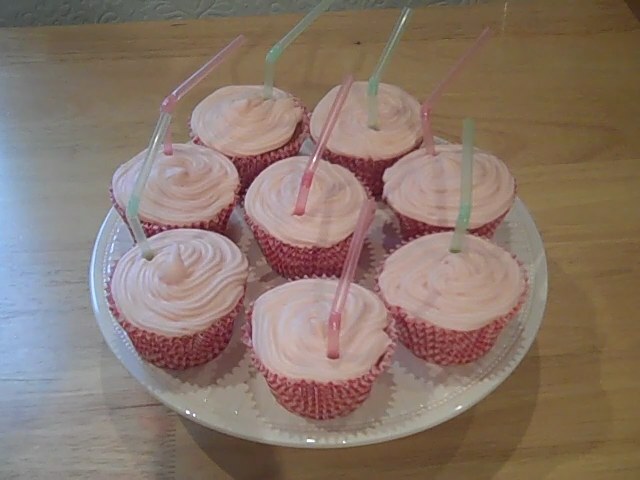 These cupshakes are great fun for a kiddies party. Preheat the oven to 170°C/gas 4 and line a cupcake tin with 10 cases. Combine the flour, sugar, butter, eggs and baking powder in a bowl and mix until fluffy. In a separate bowl add the strawberry milkshake mix to the milk and stir until it forms a paste. Fold the milkshake mix into the batter until well combined. Here you can also add 1 – 2tsps of pink food colouring. Divide the batter evenly between the cupcake cases and bake for 20 minutes. Whilst your cupcakes are cooling, make the milkshake frosting by creaming together the butter and mascarpone in an electric mixer. Combine the milkshake mix and milk to create a paste then beat it into the frosting. Add 2 – 3tsp of pink food colouring, unless your using the gel type colouring in which case you’ll need less. Once your cupcakes are cooled decorate as you wish. To make Chocolate cupshakes, replace the strawberry milkshake with chocolate milkshake.